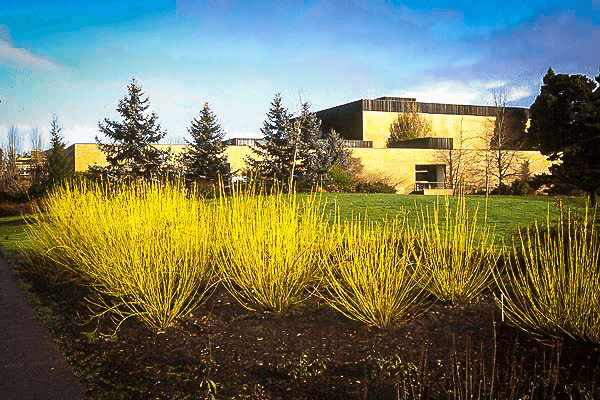 The Yellow Twig Dogwood is an attractive small shrub reaching perhaps 6 feet in height, which is grown mainly for its attractive and interesting bright-yellow stems during winter. After the leaves turn deep-red in fall, they drop to reveal brilliant twigs in a stunning shade of lemon-yellow. This shrub will grow in any kind of soil and it thrives especially well in damp and even wet soil – locations where other plants often fail. It is very winter-hardy, all the way down into zone 3. To develop the longest twigs with the best color, prune hard in early spring every second or third year. 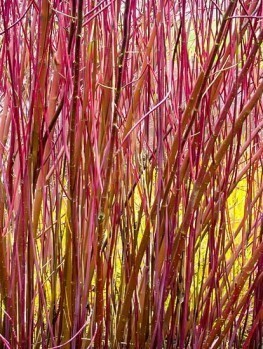 Plant the Yellow Twig Dogwood in ordinary garden soil, or it grows well in wet soil. 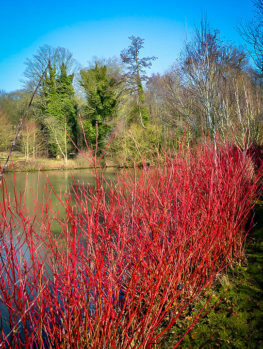 It makes an excellent plant for winter interest and it can be grown as a low casual hedge or a property boundary screen, as well as among other shrubs or featured by a pond or stream. Plant in groups to create a natural landscape effect, or use to make a low, informal hedge. This plant has few serious problems, it is resistant to deer, and it is easily grown in a wide range of conditions. During the winter most plants are uninteresting. Particularly in colder regions, where there are very few broad-leaf evergreens and most shrubs are deciduous, the grey or brown bark of leafless shrubs can be boring. So growing plants that have interesting shapes in winter – or even better are colorful – is a great way to make the winter-garden more interesting and take away the winter blues. 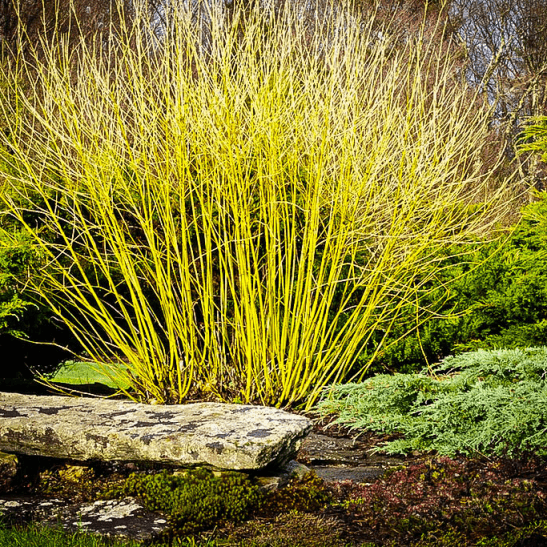 The Yellow Twig Dogwood has slender, upright winter twigs in a beautiful shade of lemon-yellow that catch the winter sun and brighten the garden. 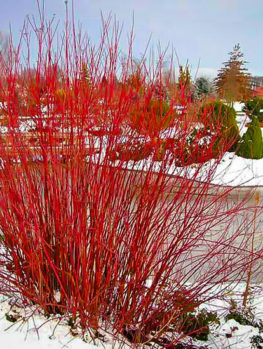 It looks even more attractive when grown with its companion the Red Twig Dogwood, which is very similar except that the twigs are a rich red color. They make a beautiful combination. The Yellow Twig Dogwood is a deciduous shrub growing to 5 or 6 feet in height and about 4 feet wide. The oval leaves are around 2 inches long and they turn a brilliant deep-red in the fall, making this plant attractive and eye-catching at that season too. However, it is when those leaves drop to the ground that the great beauty of this shrub is revealed. The thin branches are a rich shade of yellow that sparkles in the sunlight and brightens the darkest garden. It also sometimes has small white flowers in clusters about 3 inches across, which may be followed by white berries popular with birds. It is hardy from zone 3 to zone 8, so only in the very warmest areas is this shrub not possible as a valuable and attractive addition to the garden. It will grow in all soil types, from sand to clay, but although it is fairly drought-resistant once established, it does best in soils that do not dry out too easily and is very happy in soil that is always damp or wet. It doesn’t suffer from serious pests or diseases and it is even usually not eaten by deer, so it is a good choice for natural or wild gardens. This plant has a variety of different uses in the garden. 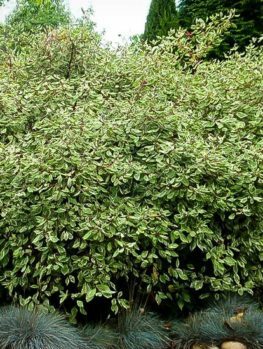 It can be grown as a low, natural hedge or barrier and it is especially useful as a low-maintenance marker for the boundary of your property. It can be used with other shrubs in mixed plantings around the house or further out into the garden itself. However, it is around water or in damp areas that this plant really stands out. Wet areas are often hard to plant, since most plants prefer well-drained soil. 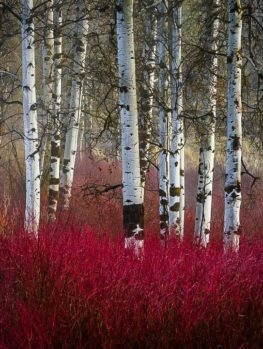 However the Yellow Twig Dogwood is naturally adapted to wetlands, so it thrives in damp areas of the garden, by a pond or along a stream. Its bright color looks attractive reflected in the still, dark water in winter, or standing out boldly against the snow or ice. 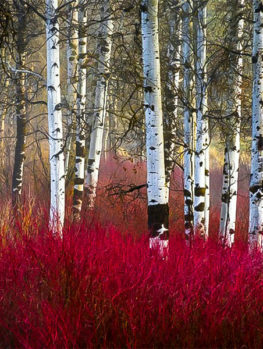 To plant your Yellow Twig Dogwood, allow 3 feet between each plant for groups or rows. Dig a trench or a planting hole three times wider than the pot and place the plant an inch or two deeper than it is in the original pot. Replace most of the soil and firm it down around the roots. Fill the hole with water and when that has all drained away replace the rest of the soil. Water at least once a week during the first growing season and after that when the soil has dried. Established plants are fairly drought-resistant, but they will grow better with a good supply of water. 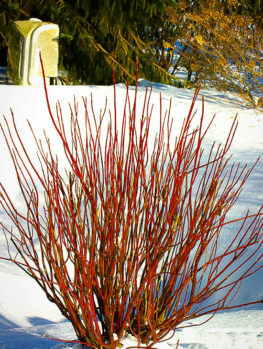 The Yellow Twig Dogwood is a low maintenance plant and can be left un-pruned to grow naturally. However, the strongest color is seen in young stems, so to encourage lots of new growth two pruning methods are used by experienced gardeners. One way is to remove about one-fifth of the branches each spring, before the new growth begins. This will encourage more new shoots that will show the best and strongest color. A second method is to cut the plant completely to the ground every three years, again in early spring before growth begins. Plants will quickly re-sprout and send up long stems to around 3 feet in height, with very bright and bold winter color. This method should only be used on strong, well-established plants growing in good soil with plenty of water. 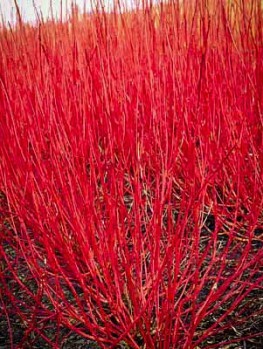 The Yellow Twig Dogwood is a natural variation of the Red Twig Dogwood (Cornus sericea), which is a native plant found all across the colder parts of North America. This remarkable color-form was collected and introduced to gardens by the German botanist and nurseryman Franz Ludwig Späth in 1899. Späth built a famous garden and nursery outside Berlin, which still exists today as an arboretum. The full name of this plant is Cornus sericea ‘Flaviramea’ and it may also be listed under the older name of Cornus stolonifera. Because of its special twig color, this shrub can only be grown by taking stem pieces from correctly named and identified plants. Our plants are grown the correct way, and you should always try to avoid cheaper seedling plants that will not show the wonderful yellow color of the twigs and will only be a disappointment in your garden. To make sure our customers get the very best plants possible, we are constantly renewing our stock and receiving new shipments. However, this striking and easily-grown plant is very popular and sometimes shortages can occur. 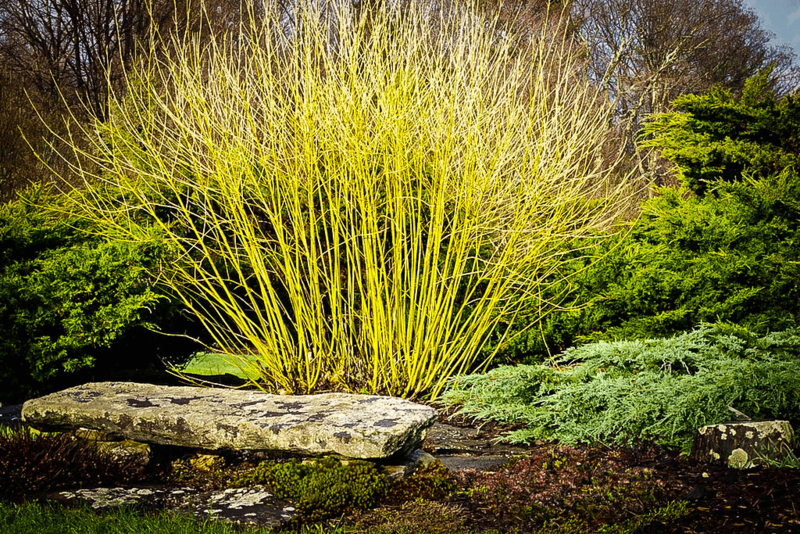 So order your Yellow Twig Dogwoods now and avoid losing out on brightening your garden during the dark days of winter.